When a woman's estranged husband returns home looking for a way to unload a stash of stolen drugs, he hooks up with his wife's neighbor, an old small-time gangster who sees this as an opportunity to relive his glory days. Since the drugs were stolen, it brings trouble to everyone involved. When we look back at many of the movies that have been nominated for Oscars throughout history, sometimes we scratch our heads and wonder what the social climate was like at the time that allowed this or that particular film to be nominated for Best Picture. This is what happened when we were finished watching "Atlantic City." It is directed by Louis Malle and is written by Jon Guare. It stars Susan Sarandon as Sally, a woman who works at an oyster bar inside a casino in Atlantic City and has dreams of becoming a card dealer in Morocco. When her no good, estranged husband Dave (Robert Joy) shows back up after running away with her sister Chrissie (Hollis McLaren), it throws Sally's life into chaos. Dave recently stole a stash of drugs and is looking to earn a quick buck before he and Chrissie's baby is born. He eventually approaches Sally's neighbor Lou (Burt Lancaster), who was once a small-time gangster, to help him unload the drugs. Lou happily accepts as he is looking to relive his youth. When the people Dave stole the drugs from come looking for them, it puts everyone's lives in danger. 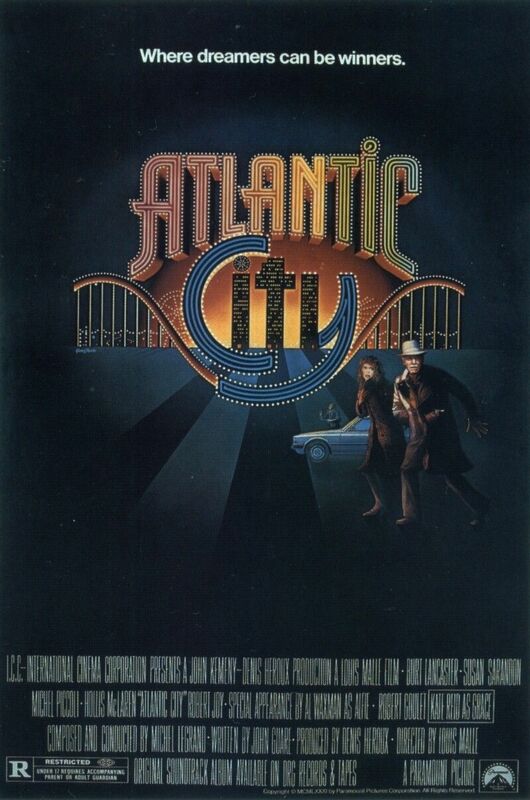 There is a lot going on in "Atlantic City." In some ways, it is this crime drama. In other ways, it is a romance. It is also a bit of a slice-of-life film about a woman trying to follow her dreams and make her life right. Despite the fact that Susan Sarandon's Sally seems like the main character of the story, she is actually little more than a bystander and footnote in the majority of the film. Most of the meat of the narrative is allocated to Lou and Dave. Sally is merely the catalyst that brings the two of them together due to Lou's obsession with her and because Dave is her estranged husband/new brother-in-law of sorts. This situation enables Lou to become the bigshot he never got to be in his youth, allowing him to pursue a relationship with Sally despite being 30+ years her senior. The plot can be a bit meandering at times and it isn't always completely engaging. It isn't a long movie but sure feels much longer than it is. Luckily, the acting is solid from Sarandon and Lancaster, both of whom were nominated for an Oscar for their performances in the film. We can't really say either of their roles are all that layered, and neither of their characters or their portrayals of them elicited much emotion from us. "Atlantic City" is one of the most forgettable Best Picture nominees we've seen. This film will likely be tucked away in our memories until a decade down the road when we realize, "oh yeah, we did watch that one."